Developing Story: Jordie Johnston - College Hockey, Inc.
As a senior, Jordie Johnston has surpassed his first three seasons' totals in goals (16), assists (12) and points (28). 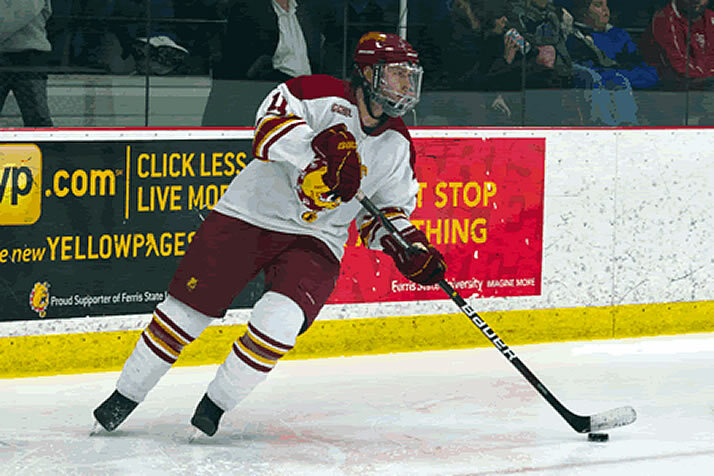 Jordie Johnston had 10 goals his first three years at Ferris State, finding himself a regular contributor, to be sure, but far from an offensive force. Johnston's Ferris State team is No. 1 in the nation for the first time in the program's history. According to their top scorer, that hasn't changed the outlook in Big Rapids. "It's nice to be acknowledged," he said, "but everybody here knows what our job is. We remember how much is ahead of us." That’s changed this season, as the senior left wing leads the top-ranked Bulldogs in goals (16) and points (28), thanks in part, he says, to some extra work with associate coach Drew Famulak. Famulak brushes off what many might perceive as a slight. According to Famulak, the routine’s roots lie in an unlikely place. Head coach Bob Daniels was visiting the Ferris State men’s basketball team’s practice in the fall, talking to the coaches about the extra shooting drills their players did. The basketball coaches felt like their players, even in practice, weren’t taking enough shots. Daniels brought that philosophy to the rink. The extra work has paid immediate dividends for Johnston. The former Saskatchewan Junior Hockey League Player of the Year averages a goal every other game for the No. 1 Bulldogs, and his first career hat trick – Jan. 6 vs. Colgate – sparked the team’s current 9-0-3 run. Famulak contends that there’s good reason Johnston’s confidence is up – so is his skill level. That bodes well for the Bulldogs and the Rosetown, Saskatchewan, native, who plans to pursue pro hockey after graduation. For now, he’s focused on helping his team live up to its No. 1 ranking, and he’ll keep preparing by firing less-than-perfect passes into the net after each practice.